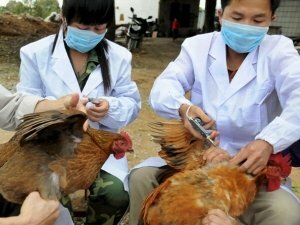 Scientists have reported the first case of human-to-human transmission of the new strain of bird flu that has emerged in China. The British Medical Journal said a 32-year-old woman was infected after caring for her father. Both later died. Until now there had been no evidence of anyone catching the H7N9 virus other than after direct contact with birds. But experts stressed it does not mean the virus has developed the ability to spread easily between humans. By 30 June there had been 133 cases of H7N9 bird flu reported in eastern China and 43 deaths. Most people had visited live poultry markets or had close contact with live poultry in the week or two before they became ill. Yet researchers found that the 32-year-old woman had become infected in March after caring for her 60-year-old father in hospital. Unlike her father – who had visited a poultry market in the week before falling ill – she had no known exposure to live poultry but fell ill six days after her last contact with him. Both died in intensive care of multiple organ failure. Tests on the virus taken from both patients showed the strains were almost genetically identical, which supports the theory that the daughter was infected directly from her father rather than another source. Public health officials tested 43 close contacts of the patients but all tested negative for H7N9, suggesting the ability of the virus to spread was limited. The researchers said that while there was no evidence to suggest the virus had gained the ability to spread from person to person efficiently, this was the first case of a “probable transmission” from human to human. “Our findings reinforce that the novel virus possesses the potential for pandemic spread,” they concluded. Dr. James Rudge, of the London School of Hygiene and Tropical Medicine, said that limited transmission between humans is not surprising and has been seen before in other bird flu viruses, such as H5N1. He added: “It would be a worry if we start to see longer chains of transmission between people, when one person infects someone else, who in turn infects more people, and so on. An accompanying editorial in the BMJ, co-authored by Dr. James Rudge, concluded that while this study might not suggest that H7N9 is any closer to delivering the next pandemic, “it does provide a timely reminder of the need to remain extremely vigilant”.